As many of you are familiar with, in order to use Draft Wizard's Draft Assistant with your live draft, you have to have the Assistant in one tab and your draft room in another. Swapping back and forth isn't that big of a deal, but why not marry the two? 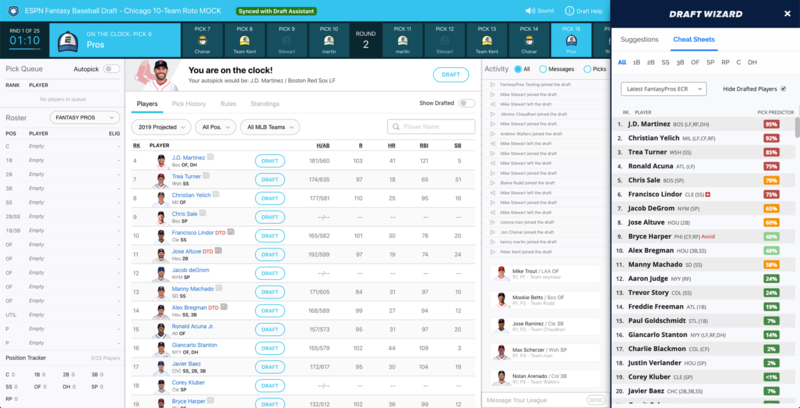 Starting last year with 2018 fantasy football and with a huge improvement for 2019 fantasy baseball, you can get draft advice directly in your ESPN live draft (or mock draft) with the FantasyPros Chrome extension, via the Draft Wizard Draft Assistant. The ESPN Draft Assistant in action. Your cheat sheet(s): customize before your draft and bring it with you into the draft room. Pick Predictor: one of our premium users' favorite features, see the likelihood of a player being drafted before your next turn – this helps you make better decisions for your current picks. Player tagging: target, avoid, sleeper? Set that up in your cheat sheet and they'll show up during your draft. Player cards: click on a player in the suggestion queue to read the latest player news, analysis, and check out their in-depth stats and projections. Draft from the assistant: you don't have to hunt down the suggested player in the ESPN draft room – simply draft directly from the Draft Assistant! One of the most popular features of Draft Wizard: the Pick Predictor, integrated with your cheat sheet. In addition to this feature for ESPN drafts, the FantasyPros Chrome extension also allows you to view player cards across all the websites you browse, so you can quickly get the latest fantasy news as well as check player availability in your imported leagues. You can install the Chrome extension here.